The KTM 250 SX-F engine is known to be the strongest engine in the 250cc class. It screams at the top of its lungs at 14,000rpm, but is equally happy producing tons of torque and power across the rest of the rev range. Its compact architecture contributes to an excellent mass centralization, supporting the rideability of the bike. And it only weighs 47.6 pounds. That’s including the incredibly beneficial E-starter. The centerpiece of the compact DOHC engine is the cutting-edge cylinder head. It features two overhead camshafts, which activate the titanium valves via super-light finger followers with a hard DLC coating. New lateral brackets (now made of aluminum instead of steel) allow an efficient fixation of the engine to the frame and shave off even more weight. The 250 SX-F has an extremely rigid crankshaft, which features a connecting rod with a plain big end bearing with two force-fitted bearing shells running directly on the crank pin. This design is a major prerequisite for the extremely high engine speed levels and the unrivaled maximum power of the 250cc engine. Not only that, it enhances the engine’s durability, allowing long crankshaft service intervals, which is a huge customer benefit in relation to time, effort and cost. The reliable 5-speed transmission features a special surface treatment on the 2nd, 3rd and 4th gears for solid reliability. The advanced ´No Dirt´ gear shift lever design prevents dirt from jamming the joint of the lever and guarantees precise shifting even in the muddiest conditions. All 4-stroke SX-F engines are fitted with a gear position sensor for tailored engine mapping for each gear. For 2018, the transmission shaft gets a new C4 bearing that has a bigger overlap in the case. This means reliability even under extremely hard conditions. Inside the short cylinder, with a bore of 78mm, thumps a box-type piston made by CP. Its crown geometry is adapted perfectly to the high-compression combustion chamber (14:1), where its rigid structure and low weight shine. Thanks to the low oscillating masses, the engine is snappy as it is strong. 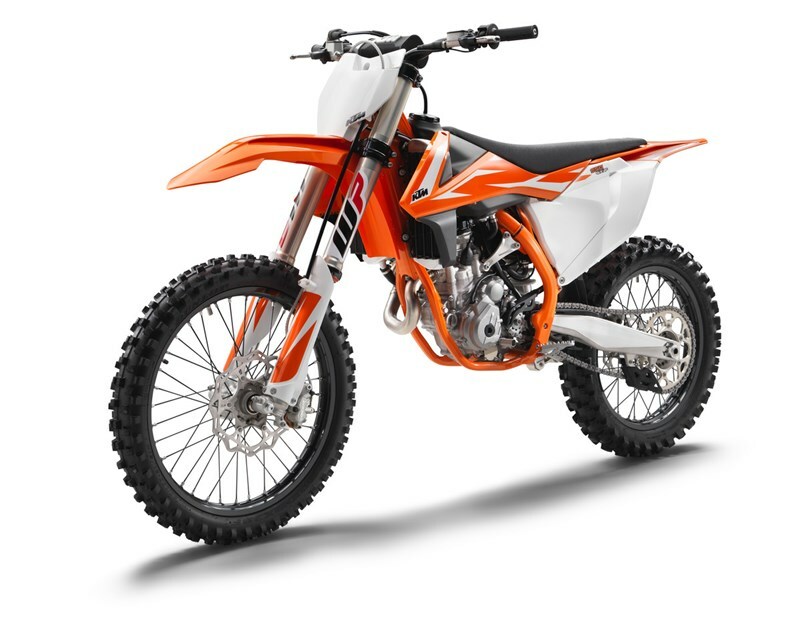 The KTM 250 SX-F employs the KTM-developed CSS clutch (coil spring steel) with a robust steel basket and extremely heat resistant clutch plates and new, nitrated steel liners reducing the wear. Light operation and telepathic amounts of control are standard with this hydraulic Brembo actuated clutch.